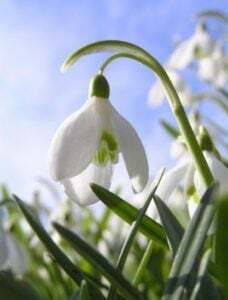 The Snowdrop flower (Galanthus) is the January birth month flower they grow from late winter into early spring. Since this is a winter flower they grow best in the cooler climates. In areas where the weather is warmer, they will not grow to their best potential. While they do not grow well in the summer sun, they do still need to be planted in areas of some sun in order to grow their best in the winter. They also need to have some shade throughout the day in order to live a long life. Since they are flower bulbs they need a period of winter coldness before they begin to grow at the end of winter. Snowdrop bulbs will dry out if not planted right away. So make sure you are ready to plant the flower before you buy the bulbs. You can group the bulbs in large amounts while planting. Place 10 or more bulbs in a perfect spot, and watch the beauty that grows right before you. With such a large grouping of plants together, it will surely brighten up your winter. Plant each bulb about 2 to 3 inches deep in the soil. Space them only a couple of inches apart. They will have to be watered after you plant them. Water them daily, as they need it. When they begin to grow, you will see where they get their name. Among tall, sharp looking green stems and leaves, grow beautiful bell shaped little white flowers. They look like drops of snow falling from the sky. They grow low to the ground and only reach about 10 inches tall at most. 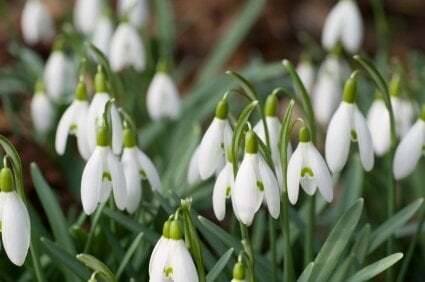 Once you see snowdrops poking up from the ground, you will know that spring is near. Crocuses and daffodils will shortly follow the winter show starters. This winter flower will multiply as the years go on. They will release small bulbs that will be pushed out of the ground. Dig up these bulbs while the plant is still alive. Don’t wait until it goes dormant. Replant the bulbs quickly and they will grow by the next winter season. Be creative with where you plant these special flowers. Place them in places where you will be sure to see them. They will surely make for a lovely winter landscape.